For many MLS sides, qualifying for the CONCACAF Champions League is one of the ultimate goals each season. The competition provides a chance to test themselves against the best sides in the region, play in some of the most storied venues in North and Central America and — if they can actually win the whole shebang, a feat no American club has yet managed — an opportunity to play in the yearly Club World Cup. But it’s important to remember that not every ground and opponent an MLS side might be drawn to face is exactly worth all of the hype. Take for example Portland Timbers’ first round opponents in this season’s CCL: Guyana’s Alpha United FC. Already an oddity in CONCACAF due to the fact that the country is technically in South America, Guyana is also a country where cricket is the first love. And despite Alpha being the three-time reigning champion of the Guyana National Football League, they play their matches in the Bourda Cricket Ground. However, the stadium itself didn’t meet CONCACAF standards, and thus they have to play their matches at the newer, larger and more modern Providence Stadium. Which is pretty ironic, considering Portland play their home matches Providence Park. 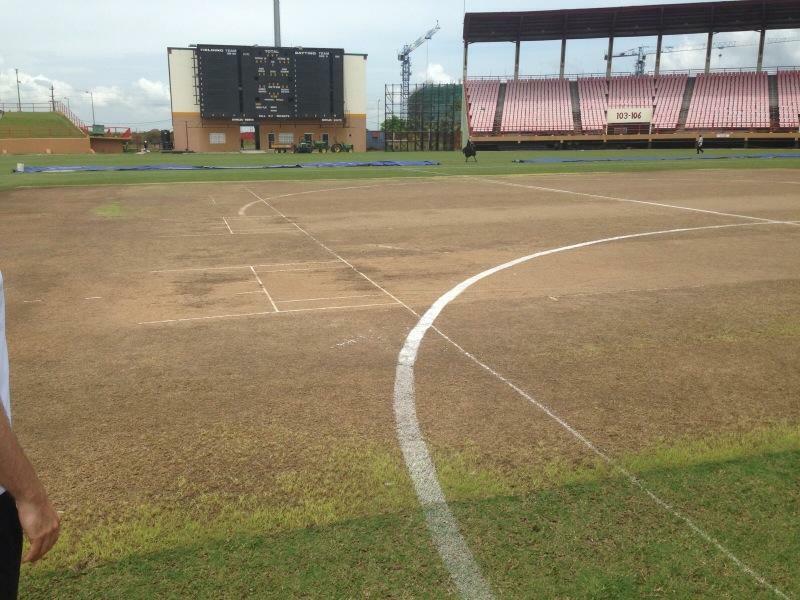 Yet despite the upgrade, it still featured a humongous dirt patch — used as the cricket’s bowling and batting area — smack dab in the middle of the pitch. And as the picture tweeted out by Portland owner Merritt Paulson shows, it made for quite the rough playing surface. Luckily, the Timbers still managed to pull off a 4-1 victory in spite of the sub par surface they were forced to make their CCL debut upon.